Are you eating quinoa yet? If not, then you definitely should be! I’m a recent convert after having eaten a delicious dish called the Happy Vegan at Tender Greens in Walnut Creek and then fell completely in love with the versatile superfood after an impromptu picnic with CK. That day I picked up a good to the last bite combination of quinoa, arugula, beets, goat cheese, and mandarin oranges from Fleur de Sel and promptly went home to make a grocery list to recreate the dish at my leisure. And oh have I ever! Needless to say, I was pretty stoked to get my hands on this brand new cookbook called Quinoa Cuisine that’s packed with 15o ideas for getting your quinoa on. Quinoa is gluten-free and therefore a great alternative staple to keep on hand for your friends and family who are sensitive to such things. Quinoa flakes are a real thing. I’ve heard about and used quinoa flour but not flakes. Apparently they resemble rolled oats and are good to use in place of breadcrumbs. Rinse your quinoa! I learned this the had way when I cooked an entire bag without doing so. It was so bitter from the saponin coating that I ended up throwing it out. Even if your packaging says that it has been pre-rinsed I wouldn’t take the chance. It takes less than a minute to run it under a little water in a fine mesh strainer. Quinoa isn’t cheap. Buy it in bulk. Jessica Harlan and Kelley Sparwasser are right on about this point. I quickly got sick of paying for expensive single bags at my local grocery store. Not to mention that half the time they were sold out. I ended up using the subscribe and save option on Amazon and now have a healthy supply on hand at all times. That big stockpile will definitely come in handy with the huge array of recipes in this great reference. I love the idea of substituting quinoa for rice in paella, pilafs, and stews. Not to mention all of the great vegetables and pies that you can fill with the fluffy stuff. Plus there’s an entire new facet of baking opened up to you with the use of quinoa flour. Recipes for crepes, pie crust, pancakes, and even buttermilk biscuits are all intriguing enough for me to feel my ingredient shopping urge kick in. 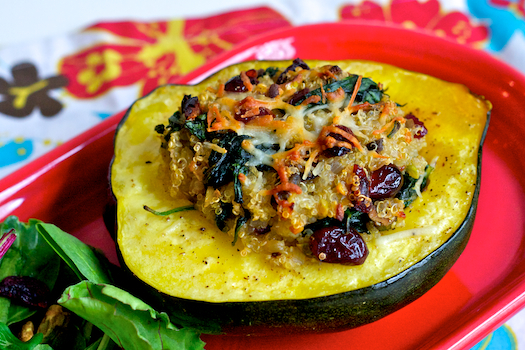 But until that special flour arrives on my doorstep we can tide ourselves over with this healthy, filling, and super nutritious stuffed squash. It couldn’t be easier to prepare and it’s quite pretty to present to guests. You can even make the squash cups ahead of time and bake them off just as your companions arrive. They’ll think you slaved in the kitchen all day, and you can feel good about serving something that won’t make anyone feel guilty about over indulging in customary dinner party wine and dessert. I have to get the cookbook! We have been eating quinoa more and more lately. so good… but yes… you HAVE to rinse. 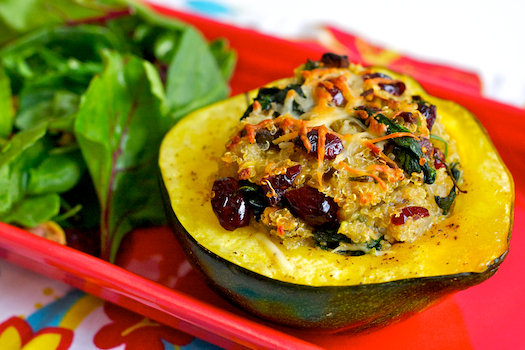 Your stuffed squash looks so good. This looks delicious, thanks for sharing! I’m also glad that you mentioned Amazon because that’s one place I didn’t look yet for this amazing little grain! This looks absolutely delicious! 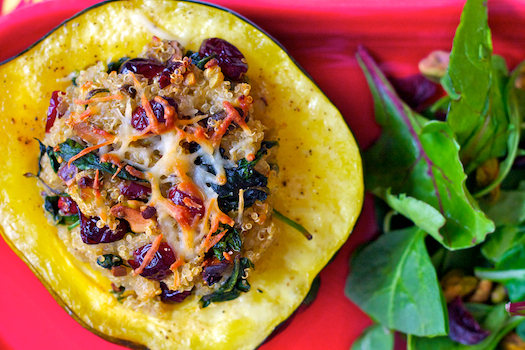 I’m a huge fan of quinoa stuffed acorn squash, but I like the twists in this recipe. I usually use fresh pears and chickpeas, but that can feel heavy. This seems light and healthy. Can’t wait to try it! Thanks! !